Ben Schwartz and Larry King are fast friends as they discuss the need for a Jewish superhero, how Ben got into the mind of a duck for ‘DuckTales,’ & his new book on dating. Plus, Ben drops the mic with what might be the world’s best impression of Larry. 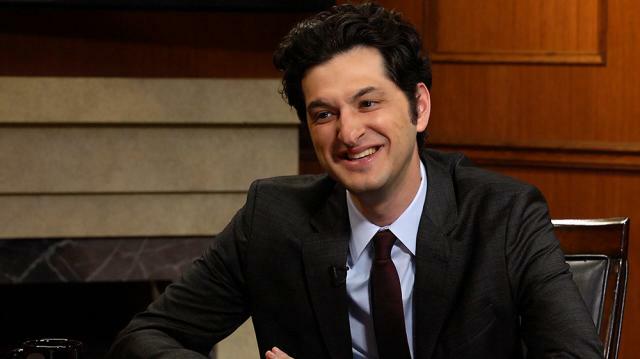 Does Ben Schwartz do the best Larry King impression ever? Larry King interviews Ben Schwartz, an Emmy Award-winning writer, actor, and director known for his roles in ‘Parks and Recreation,’ ‘House of Lies,’ ‘This is Where I Leave You,’ and ‘Funny or Die’ videos. Schwartz will star in the ‘Duck Tales’ revival as Dewey, and is also co-writing a new book, ‘Things You Should Already Know About Dating, You F*cking Idiot.’ Schwartz jokes with King throughout the interview and even asks Larry questions. Larry begins by asking about ‘Duck Tales,’ and Schwartz recounts watching the original series as a kid, and connecting with it. Larry asks how Schwartz gets into the mind of a duck, and drops some acting advice from he heard from Marlon Brando. Schwartz makes fun of Larry for name-dropping, and describes his character as having the spirit of an adventurous young kid who wants to do everything. Schwartz too enjoys doing a lot of things, Larry notices, and asks about Schwartz’s upcoming project with Will Ferrell and Seth Rogen. Schwartz isn’t able to reveal many details, but describes it as an action comedy with a script he wrote, then talks about selling scripts that have not yet been produced. Larry jokes that Schwartz is a failure except for ‘Parks and Recreation’ which Schwartz acknowledges, praising the show’s great writing staff. Schwartz then asks Larry questions about his television preferences, and Larry reveals he watches ‘Seinfeld,’ since he didn’t have time back when the show was on air. Schwartz continues questioning Larry, and they joke about how Larry still uses a flip phone and is behind on modern technology. Larry regains control of the questioning and asks if Schwartz was a comic kid. Schwartz talks about reading comic books and being the class comic while growing up in the Bronx. Schwartz retraces his career, from his college studies in anthropology and psychology to writing late night monologues for David Letterman. Larry goes on a small rant about late night monologues, then asks what Ben likes about improv, inspiring Ben to call Larry the “king of transitions.” To answer Larry’s question, Schwartz says he likes how people can create an entire show with nothing prepared. Larry asks about Schwartz’s upcoming dating book, and Schwartz talks about chivalrous actions that are lost between generations. They talk about millennial dating. Asking about Schwartz’s other loves, Larry inquires about his role as Jean-Ralphio on ‘Parks and Recreation.’ Schwartz says he loved acting with a cast of comedy legends, and playing a nutjob. Larry mentions fan observations that Jean-Ralphio looks like Steve from ‘Stranger Things,’ and at Schwartz’s request, shouts to the cameras to put Schwartz in ‘Stranger Things,’ a Marvel movie, and a Pixar movie. They then banter back and forth about a possible Jewish superhero they have imagined, Sky Blumberg.